RFID cards enjoy a great popularity, especially when it comes to applications where user friendliness and fast processes are required. 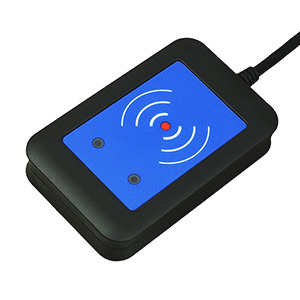 The new chip generation even managed to convice those who doubted the security of radio-frequency based transmission of ID-data: The new encryption method of LEGIC readers improves the security of contactless communication massively. Therefore newer chip generations of RFID-cards are suitable for security-related applications like access control solutions. Many customers trust those new chip generations when it comes to acces control or time tracking solutions. The well known LEGIC chip cards and LEGIC card readers from LEGIC Identsystems AG are often being used in that business field. Transparent mode: In this mode the reader is controllable with original LEGIC commands. Operating as keyboard wedge: UID output as keyboard input. Intelligent mode: In this modus the reader is freely configurable.